With a rated lifting capacity of 600 tons, the Liebherr LTM 1500-8.1 is the ideal crane for work in wind yards, industrial plants, refineries, and other large scale facilities. The 1500-8.1 is an eight-axle crane with a maximum radius of more than 100 meters and reaching heights of more than 140 meters. The 1500-8.1 has been designed to provide safer, more precise lifts. An increase in lifting height and reach can be attributed to the seven-section telescopic boom. The 4-section boom has a lifting height of 50 meters and a 48-meter radius. The use of a fixed lattice jib and addition guying system attains maximum height. Other features include safe and efficient outriggers featuring permanent supporting pads and automatic crane leveling as well as a turbo-charged, 8-cylinder diesel engine can reach speeds nearing 50 mph. The carrier technology has been optimized for both on- and off-road applications and stable cornering. The driver’s cab and crane cabin have never been more functional or as comfortable. The LICCON computer system allows for total control, including a work area limitation system that can be programmed for buildings, other cranes, high-tension wires, and other obstructions. 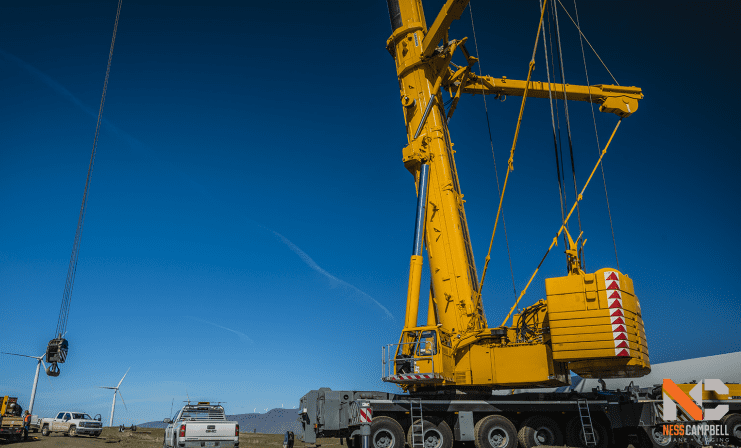 The technological advances, coupled with the standard durability and reliability of Liebherr cranes, make the LTM 1500-8.1 mobile crane the ideal choice for big jobs that require only the best. For more information on the crane, or other lifting products, contact NessCampbell today.